Have a question about burning your waste oil? Find the answer here. How much waste oil must I generate to make buying a waste oil furnace or boiler a practical decision? The average minimum volume of waste oil you must generate each year is between 500 and 700 gallons. You can also burn #2 fuel oil if you run short of waste oil. Doesn't a waste oil furnace produce black, sooty smoke and pollute the air? Absolutely not. A Clean Burn furnace burns as cleanly as a #2 fuel-oil furnace. In fact, a Clean Burn furnace is designed to burn #2 fuel oil in addition to waste oil. Won't various viscosities of crankcase or transmission oil affect the combustion efficiency of my furnace? No. Our state-of-the-art burners are designed to accommodate a range of oil viscosities, from 10w to 50w. How often will I have to clean the ash from inside the furnace? Expect to clean your Clean Burn furnace every 1000 hours of operation, on average. Cleaning your furnace is a safe and easy procedure, which takes only about 30 minutes. Are Clean Burn furnaces backed by any kind of warranty? Yes. We provide a 10-year limited warranty on the combustion chamber and heat exchanger, and a one-year warranty on all burner parts. Clean Burn’s warranty is one of the most comprehensive in the industry. What's the average length of time for payback on a waste oil furnace? And, will I ever really enjoy FREE heat? Depending on average temperatures in your region, you’ll enjoy an 18 to 24 month ROI. And, yes, free heat is your reward for a smart business decision. What is "cradle-to-grave" liability and how can it affect the way I dispose of waste oil? The federal government holds you directly and irrevocably responsible for pollution management, clean-up and disposal control of waste oil. Simply put, the liability for waste oil exists until it is burned (i.e. recycled). Isn't it more convenient and less troublesome for me to contract with a hauler or refiner to transport my waste oil? It may be easy for you to pay a hauler to pick up and dispose of your waste oil. But in doing so, you are giving away valuable fuel which could be waste for free heat generated by your Clean Burn Heating System. Is there any way to duct a waste oil furnace? Yes, Clean Burn furnaces can be ducted, and are UL approved for this application. Who can I rely on for after-sale service and parts support? That’s easy. Your Clean Burn distributor. Our distributors are the most knowledgeable, trained and reliable you’ll find in the industry. Your Clean Burn Distributor is an expert in recommending the right Clean Burn waste oil furnace for your application. This recommendation includes a wide range of variables and, as you will see as you read further, can be complex. 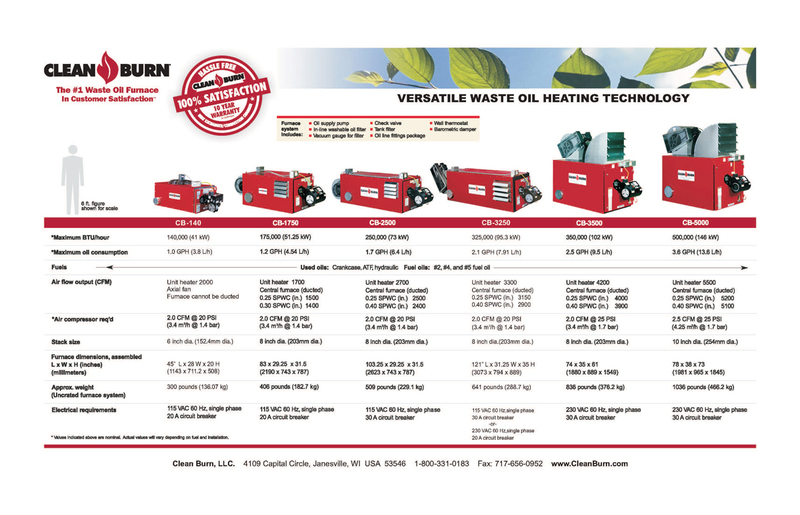 Contact your local Clean Burn Distributor today for a free, full heat loss calculation for your facility. *Note: All furnaces/boilers must be sized by their BTU/hr’s output ratings and not their BTU/hr’s input ratings. If you size them by their listed inputs, you will be undersized and it will not heat the building properly. Air Infiltration: Check for gaps around the doors and windows of the building. A 1” gap around a 12’ x 12’ door is equal to a 1’ x 3’ hole in the sidewall of the building. No heating appliance will be able to adequately heat a “drafty” building. Building Configuration: A long, narrow building, will be more difficult to heat than a short, more squared building. Example: A 40’ x 50’ building has 180 linear feet of exterior wall surface, while a building 20’ x 100’ has 240 linear feet of exterior wall surface. Ceiling Height: If the ceiling is more than 14’ high, you must install ceiling fans to re-circulate the heat from the ceiling down onto the floor area. Install one, 3-bladed, 56” industrial ceiling fan every 2,000 square feet of inside building space. Heat Recovery: A larger heating appliance than is normally required may be necessary to install in a building where the garage doors are left open a lot or opened and closed frequently. Insulation: A building with no insulation will have a very large heat loss and will be very difficult to heat during the winter months. Also, a building that leaves the garage doors open or one that opens and closes their doors a lot, will require added heat. Make sure that you use the correct correction factor when sizing the equipment in these kinds of situations. Amount of Waste oil Available: The heating appliance should never be sized by this requirement. It should always by sized by the heat loss of the building. However, if you size the heating appliance based on the amount of waste oil you generate, the heating appliance will not be sized to properly heat the building. It will only be able to supply a portion of the total heat load, and other heat will need to be installed in order to properly heat the building. IMPORTANT: Do not remove the old heating appliance from the building if it is in proper working order. The old unit can provide auxiliary heat on extremely cold days, and can provide back-up heat should the Clean-Burn unit require service or maintenance.